Haven't had much time to play TEF lately, but Fieran has been developing more in the back of my mind. I've decided on the theory of the forest being some sort of purgatory/afterlife. Fieran remembers nothing of his previous life except the sensation of drowning. He sometimes sits and stares into the river as if it'll give him answers, though he's too scared to approach the lake due to how deep it is. He's a gentle soul and wouldn't hurt a fly, though he's also very lonely because he's too nervous to approach other deer. Fawns seem to be attracted to his gentle nature and he often finds himself surrounded by small groups of them, which he doesn't mind, but he's scared of other stags. The forest brings him peace, but at the same time, he wants to know how got here. Also, wrong season for the bats, I know, but I originally started this back in October last year. XD He hadn't managed to find BZD to get his skull mask at that point - and also Fieran has changed antlers twice since then and is now back to default antlers with no flowers. 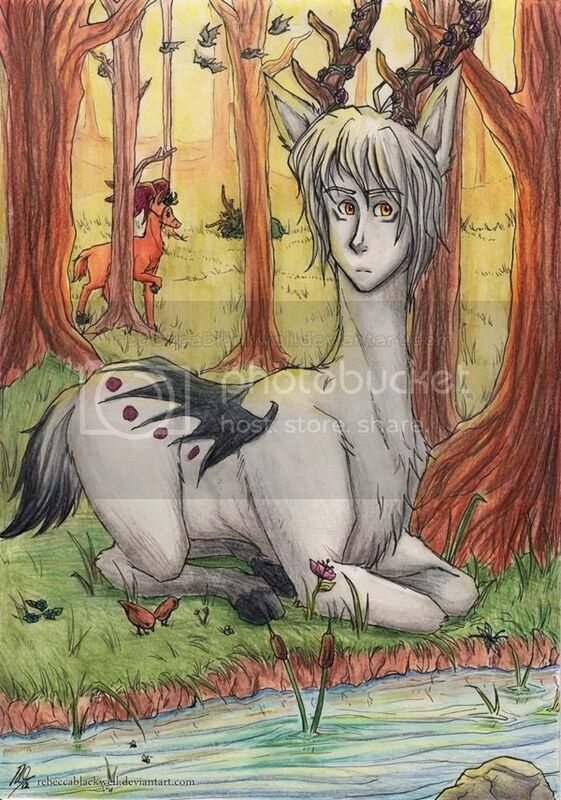 The deer in the background are random, no one in particular! February 17, 2013 - 4:12am — ems.